Few years ago Annalina Kazickas' passion for nature, helping others and her creative mind lead her to Vilnius Urban Garden that started with a small group of community members and green activists in 2012. Now it includes about 10+ active members plus wider base of supporters. Small support from municipal community funds grew into the largest urban garden initiative in Lithuania (maybe the Baltics as well). Now it doubles in size annually and includes a greenhouse as well. It's a non-profit, volunteer based, community focused organisation that puts primary focus on the process and believes in shared work - shared harvest idea. Vilnius Urban Garden plans to launch new gardens with other communities, engage municipality and it’s companies, continues searching for new linkages: schools, restaurants, public and private sectors with a bigger than just a garden purpose - to build strong communities. 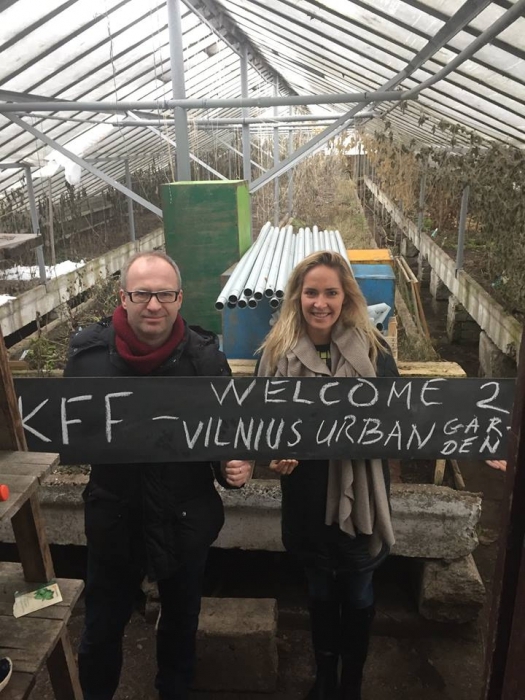 Thanks to the continuous support from the Kazickas Family Foundation an automatic watering system at the Vilnius Urban Garden has been installed recently. Is a big relief for all making maintenance of the garden an easier task. Vilnius Urban Garden is inviting all the gardeners and the ones willing to learn all about it to join them on Saturdays at 11 am at the Antakalnis community Gardens at Sapiegos park for spring work.